Titan Theias exterior surface is made of deep luxurious black, glossy piano lacquer. The elegant finish complements the design and sculpturally adds sophistication and exclusivity to any decor. Very few center speakers live up to the acoustic performance of the stereo speakers they are paired with. 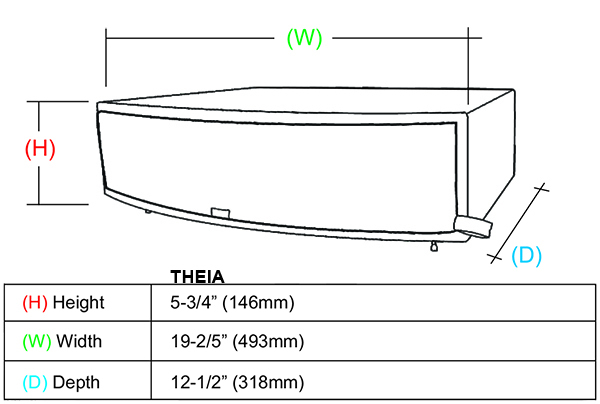 The Theia ups the ante on performance by an order of magnitude by incorporating several advanced core Earthquake technologies. PMT: (Piston-Max Technology) A patented Earthquake technology that enhance acoustical output while keeping a minimal footprint. The 4 inch wideband woofers are manufactured using the Piston-Max Technology. 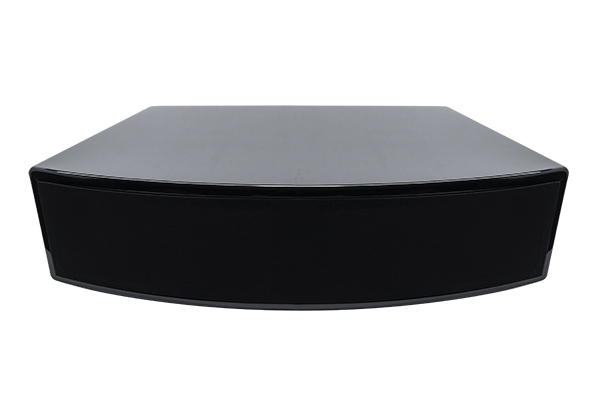 dramatically increases sub-harmonic frequency response and dynamic output capability. In the Theia the quad 4 inch XLT wideband Kevlar cone woofers are pneumatically coupled to a bottom mounted 10 inch SLAPS capable of 2 inch peak to peak travel enabling battlefield level effects to be reproduced effortlessly. AASD: (Acoustic Array System Design) a technology combining higher acoustic efficiency with controlled dispersion ensuring uniform coverage over a wider area. Building on the lessons learned from large professional line array speaker systems, AASD uses positive interference and physical curvature to create a wide fully saturated sweet-spot, allowing for better HT utilization than traditional center speakers. While at the same time, minimizing energy waste into the vertical or off-axis plane. XLT: (eXtra Long Throw) A woofer geometry originally developed by Earthquake for heavy duty industrial subwoofers to expand excursion potential over regular long-throw woofers. XLT and PMT work in great synergy as each technology expands on one of the two parameters for sound generation - Bore and Stroke. The level of sound possible is determined largely by Bore times Stroke. Ask any car buff and they will say there is no replacement for displacement.